Welcome to the unique and elegant world of the Peterson Pipes and Tobacco, where dedication and exceptional craftsmanship work hand in hand. Whether you are a user of the line or looking to purchase a special gift for someone, the everlasting and unique quality of a Peterson product will be much appreciated. Friedrich and Heinrich Kapp opened their first tobacco shop in 1865 back on Grafton Street in Dublin, Ireland. The brothers simply christened their new shop “Kapp Brothers”, and had little idea that they were participating in the birth of a true tobacco legend. Charles Peterson would turn their world upside down when he entered their pipe shop armed with a revolutionary new pipe idea and some pretty ambitious plans for the future of their business. From that very first meeting on Grafton Street, Peterson suggested to the Kapp brothers that they go into partnership together and showcase a dream pipe idea to the world. After an agreement was reached, the company was then renamed to Kapp & Peterson. This company would go on to become Dublin’s most respected and fashionable manufacturer of exceptional smoking products. 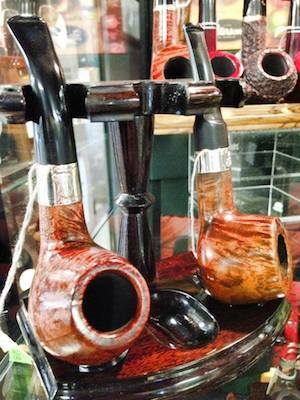 Many cigar and pipe smokers would enter the shop for advice on choosing the best handmade pipe and cigar. The Peterson name was then embraced by business leaders, writers, artists, and politicians. Charles Peterson did not rest on his unique design; he continued to have a team of skilled craftsman fine tune his work as the years passed. Whether you use the products for personal use or are purchasing as a gift, you will instantly appreciate the superior quality and range of the Peterson cigars, pipes, smoking accessories, and tobacco. What Is The Peterson System? 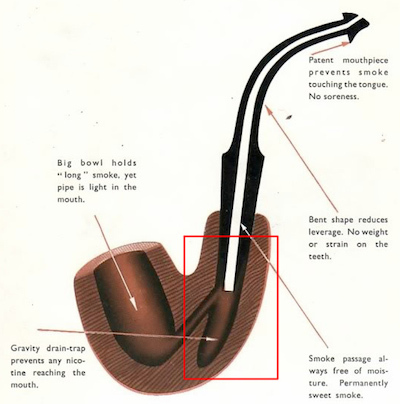 The Peterson System creates a unique smoking experience that encompasses a cool, sweet, and dry smoke, due in part to the scientific effectiveness of the original design. At the center of this unique system is the graduated bore of the mouthpiece. Suction by the smoker is 15 times weaker by time it reaches the chamber. The end result is moisture can flow in to the reservoir and will not reach the smoker’s mouth. The lip of this unique system also helps to enhance the effectiveness of that graduated bore. It works by directing the flow of the smoke up and away from the smoker’s tongue. This even distribution of the smoke eliminates the chance of bitterness and tongue bite. The shape is designed in a way specifically contoured so the smoker’s tongue will rest comfortably in that depression under the opening. The P-Lip mouthpiece is also made with vulcanite, a superior high-grade product. The standard system pipes are comprised of high quality briarwood and a specially selected high quality bowl that is mounted with the hallmark sterling silver bands with an army type mouthpiece. These pipes are available in sandblast or smooth finish. In addition to the standard systems, premier system pipes come in the same shapes. What are Briarwood and Fills? Briarwood pipes are manufactured from a natural material, the briar root of Erica Arboria, growing in the Mediterranean area. Fills are used in areas of the wood with voids caused by the root growing around grit and stones in the soil. The most successful of all the Peterson collections is the Sherlock Holmes. Produced for the first time in 1987 to honor one of the most famous fictional characters, Sherlock Holmes. This collection is available in ebony, sandblast, rustic, and smooth, coming with extra large bowls, 9mm filter, and Peterson fishtail mouthpiece. This series is a result of the union of hallmarked silver and mellowed briar. This series utilizes the highest quality bowls, combined with the intricacy of working the silver by hand so the cap fits the pipe perfectly. Every year the Peterson Company introduces new shapes and finishes to commemorate places, events, and famous people in history. They are available for limited times and appeal to the pipe connoisseur. 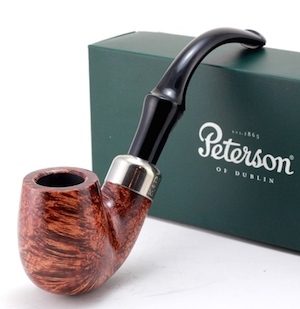 Of course every great smoking pipe needs filled with quality tobacco and Peterson provides plenty of selection. 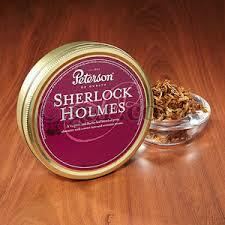 Their pipe tobacco includes traditional, aromatic, latakia, and seasonal selections. Stop by Nottingham Cigars and Pipes to browse the largest selection of Peterson Pipes and Pipe Tobacco for sale in Edmonton.